This is a frustrating time of year for the freshwater fly angler. 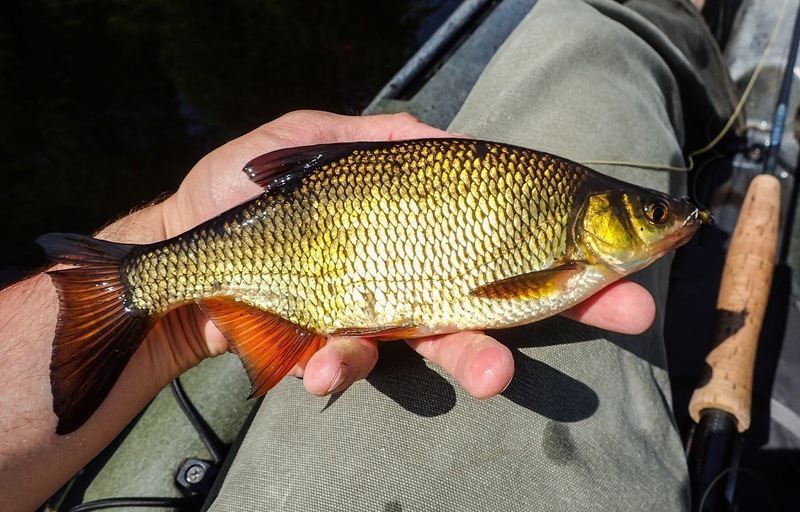 I only say that because there are so many different opportunities to catch a variety of species on fly – invariably if you decide to fish for warmwater species you are missing out on some excellent trout angling, and vice-versa. Today I decided to chase fish of the warmwater variety. 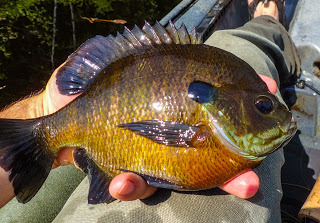 I’m a bit obsessed with big, tank-sized bluegills…you know the ones, you can’t fit your hand around them, their forehead juts out like a Neanderthal. Very cool looking fish in my opinion. They are super fun to catch on fly and this time of year, when they are on their beds, is really the only time I go after these guys. 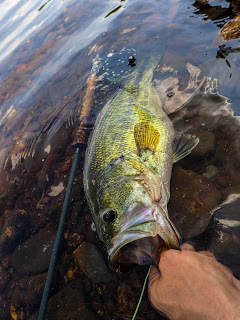 Finding them and catching them consistently has always been a bit of a hit-or-miss proposition for me. Populations of big bluegills need the right combination of abundant food and the right mix of predators to limit their density. Populations of large bluegills are easily overharvested mainly because of lower abundance coupled with the amount of time it takes for the fish to reach a large size. 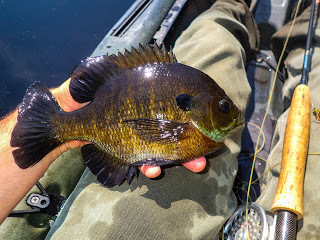 The bluegill fishing was nothing short of fantastic today. It might be hard to tell from the pictures but these fish are all over 9 inches with some pushing 10! 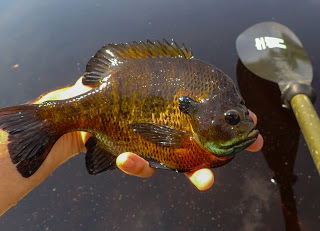 I only fished at the pond a couple hours and landed probably 25-30 bluegills all similar size. I also got a few smaller pumpkinseeds, a few smallish yellow perch, and an oversized golden shiner. All came on a small damselfly nymph slowly stripped. Small poppers and foam spiders/beetles also will work if fishing on top. I won’t divulge the name of this pond but I doubt it is a big secret (if anyone is dying to catch some of these big boys then contact me and I’ll let you know but you’ll probably need a canoe or kayak to be effective). 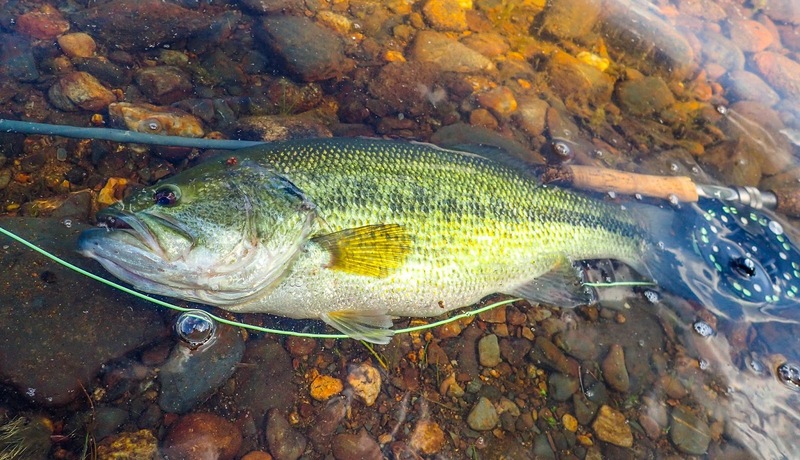 After the morning bluegill fishing I decided to head over to Wachusett to see if I could spot any bass in shallow. I fished a brown and orange cone-head streamer. I figured the fish would see it as either a sculpin or a crayfish. Covering my bases. 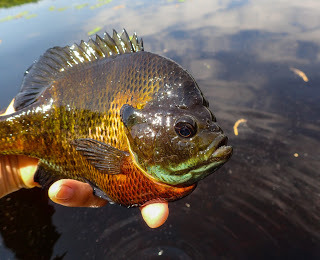 I picked up a few decent size rock bass, some miniature smallmouth bass, and even a couple big bluegills. The sunfish are all bedded up. This time last week there was almost no activity in the shallow bays I was exploring on Wachusett. What a difference a week of warm weather makes. I walked the shoreline awhile looking for bass cruising or sitting on beds. I didn’t see much. I spotted one solitary piece of wood sticking up from about 4-6 feet of water about 15 yards off shore. I knew that any bass in the area had to be interested in that cover. I was right. When I got close I saw what I thought was a pretty good fish finning lazily right at the base of the log. I cast in and he hit right on the drop. Hard-fighting, jumps and head shakes, all the things largemouth are known for. A really good fish. I didn’t have a tape but I’d guess that he was a legit 18-20″ fish with a pretty healthy girth. As far as I know Wachusett doesn’t have a huge population of largemouths but it does produce fish of good average size. Well, that was my Saturday. The rest of the long weekend is going to be devoted to trout, trout, and more trout. Hopefully everyone else is able to get out fishing this holiday weekend!